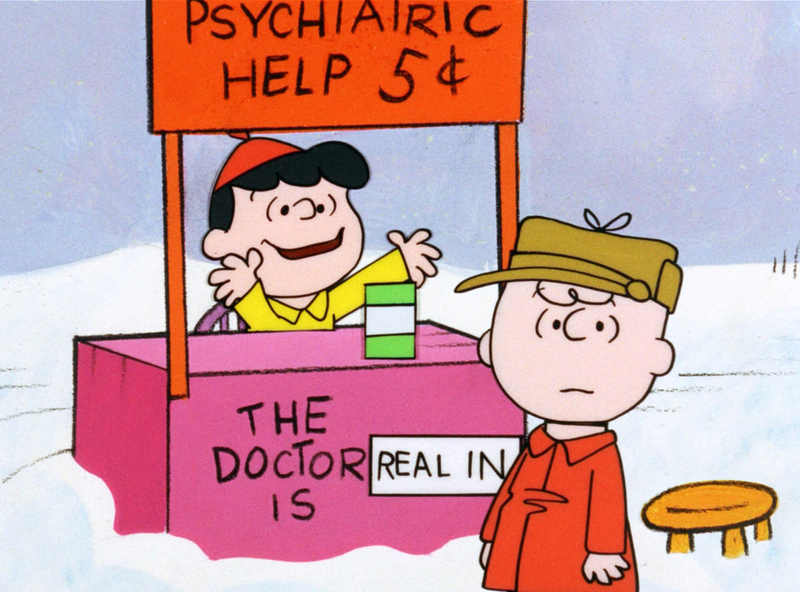 After watching “A Charlie Brown Christmas” for the umpteenth time (yes, I have my Christmas rituals), I had the urge to join Charlie Brown and visit Lucy’s Psychiatric Booth for some advice. After all, her advice was quite sound. Lucy counseled with, “The mere fact you realize you need help indicates that you are not too far gone.” After ruling out a multitude of phobias, she suggested “involvement.” She suggested he direct the upcoming Christmas play. Even though he didn’t know how, he agreed to his assignment and in the rocky process, learned the true meaning of Christmas. Wouldn’t it be great if we could turn the corner and find Lucy with her little booth and receive appointment-free, insurance-free, HIPPA-free psychiatric advice for only 5 cents? Sometimes we are so down in the dumps we don’t want to jump through all those routine hoops! It seems easier to just crawl in a hole. If this sounds like you, keep heart. At the end of this article, I will provide free resources that don’t cost a nickel. There are different reasons people feel down during the holidays — lack of connection, family problems, money problems, reminders of lost family members, too much stress combined with too little time and too little sleep, lack of sunlight, and the list goes on … the reason doesn’t matter — this experience is real. Thirty-two years ago, I lost my mother in a tragic accident just three weeks before Christmas. Since that sounds like a long time ago, you would think I would be over it. Yet when it feels like yesterday, it’s not so easy. Even though I can go through the motions of decorating, attending Christmas events and putting on a happy face, not once have I been able to stop the undercurrent of that life-changing event from swirling through my heart every Christmas season. “Let yourself live. Take your brokenness and allow it to be on full display. Sit with it, in the haunting majesty of space-time, and allow it to become part of your imprint upon the world. Life is a series of movements that cannot be reclaimed. So it is imperative that you claim them as they cross your horizon. I appreciate those words because I have never believed anyone who told me “time will heal” or “you’ll get over this.” Once I realized I would never fully get over losing my dear mother, I set myself free to grieve in my own way. “I didn’t get to report to her on how I kept an eye on the mechanics. We held a funeral instead. I don’t know what this year will bring. I hear her voice through so many memories — sometimes I laugh, sometimes I smile, and other times I still shake my head in disbelief of that tragedy and the hole it created in my life. Despite that, the holidays are here, and I will get through. I always do. Hey Bev, Thanks for sharing these thoughts and feelings. As we get older, the losses mount up and the holidays can be bittersweet.